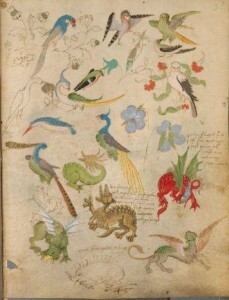 The Illuminated Sketchbook of Stephan Scriber anno 1494. This is a surprisingly well preserved sketchbook by Stephan Scriber, a monk from South-West Germany. This book is considered a playground for ideas for his work as illustrator. This gives an interesting insight into how ideas and layouts for illuminated manuscripts were tried out and skills developed in production of late-gothic bibles.